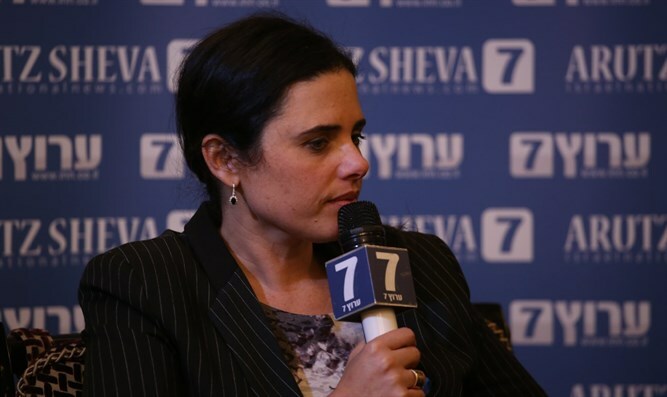 Watch Ayelet Shaked's message to participants at the "Salute to Jerusalem" Arutz Sheva Conference organized by Dr Joe Frager. Justice Minister Ayelet Shaked thanked President Trump "for being such a brave president and making the right decision" to move the US Embassy to Jerusalem in a message to participants of the "Salute to Jerusalem" Arutz Sheva Conference organized by First Vice President of the National Council of Young Israel Dr. Joe Frager. "Welcome to Israel, it is very exciting to have you here," Shaked told participants. "Actually, it is a very exciting period when the US administration is moving its embassy to Jerusalem and I want to thank President Trump for being such a brave president and making the right decision and we are all very enthusiastic about it.